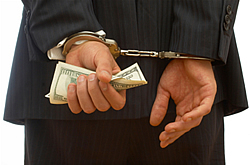 Corporate fraud and abuse is receiving increased attention in recent years. Such corporate problems often result in parallel proceedings wherein companies and individuals simultaneously face criminal and civil investigations, penalties and sanctions. Effective representation of a corporate officer or director cannot be limited to just the criminal context. Our firm is not only mindful, but also experienced in handling the regulatory issues that arise in a variety of contexts. Specifically, we have litigated with the government over Medicare fraud, claims under the Federal False Claims Act, and debarment of defense contractors. Too many firms find themselves in a position where, given the government’s often inflated charges, they feel compelled to immediately negotiate a settlement whereas we have found that an aggressive response challenging the government’s allegations can ultimately prove far more fruitful. We have also defended RICO claims. Meyerson & O'Neill also defends the victims of corporate fraud. With an extensive background in criminal defense, the practice is able to aggressively pursue the perpetrators of fraud on behalf of victims to recover their losses. In pursuing these claims, our lawyers have the advantage and experience that comes from being prior criminal prosecutors and, as a result, are best suited to co-ordinate our civil collection efforts with pending criminal actions. Read more about our white collar and business crime defense practice including representation of witnesses and targets in grand jury investigations. If you would like us to evaluate your fraud matter, please contact us via our form or call 888-773-3515 and ask to speak with a corporate fraud attorney.